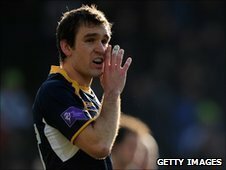 London Irish have added to their squad by signing ex-Leeds, Bristol and Harlequins fly-half Adrian Jarvis. The 27-year-old former England Saxon has joined up with the Exiles squad for the pre-season training. Jarvis said: "I feel my best rugby is still ahead of me and I am sure London Irish is the place to bring it out. "There are some talented and exciting players in the Exiles backline and I look forward to playing and training alongside them all." Jarvis started his career at Quins in 2004 where he made 32 appearances before moving to Bristol four years later. After switching to Leeds in February to help in their fight against relegation he tallied 80 points in 11 appearances. "During a World Cup year when there are key players missing it is important to have players around the squad with experience and that is something Adrian will bring to us," said head coach Toby Booth. "We have talented youngsters who will learn a great deal from him. His kicking out of hand and at goal is outstanding and it is very good to know that we will have that in our locker for this season."